Hello, it's been a long time since I was on here, but I'm back (for now at least). I've chosen the original Space Marine Rhino, and then expand into the variants, like the Whirlwind and Vindicator. I've only been collecting 40K for about 5 years, so never got a chance to buy them, but I like them. I've got two in my collection from eBay (one's a Vindicator), as well half that had been violently disassembled and supplied with the Vindicator bitz (I was forced to buy the second full Rhino to accomodate the metal parts). I've just noticed I'm derailing. 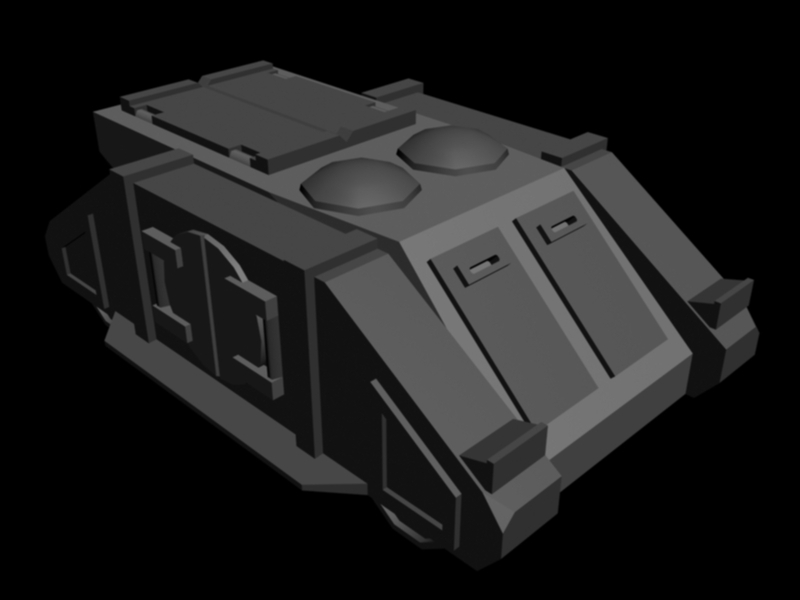 At time of writing I've modeled most of the base rhino, but haven't started the exhausts, bolters or minor details, ie rivets. Last time I looked, I think I was around 2-300 verts and faces. Does this sound right for inserting into a typical game engine? My models probably won't actually see life in a game engine, but the process ought to be a stepping stone towards greater projects. I haven't got any renders to show off yet, but I'll sort them out by monday. Any pointers will be great, such as tutorials I could follow. Of course, the detail level can't really change much with this sort of model. I'll update asap, though life and fanfiction tend to get in the way. If you can find users on fanfiction.net, my name there is Douglas-362. I currently only have one piece - a vocaloid-pokemon crossover - but should have a few more in the near future. There are no "typical" game engine specs to guide you. Each engine will have their own requirements, based on its capabilities and how your model/s will be used. 300 polys may be adequate for an old RTS like DOW, as obviously you will be zoomed out with multiple units on-screen at once. The best bet is to either pull one of the vanilla game tanks and see how many polys it uses, or check out some other user mods to see what they are doing. The Relicnews forums should have plenty of DOW modding info. Thanks, but as I said this is a possibility, I doubt it'll see any real use once I've completed the project. It's so that I can set some sort of control for a low-poly model more than anything else. Aside from the tracks etc, the common and Rhino-specific elements are finished, and i'm making a start on the Vindicator elements. When the Whirlwind I won on eBay yesterday arrives I'll be able to work on that too. When I get a Predator I'll work on that too. I know different weapon loadouts for the Predator and Razorback have different shape turrets, such as the angular autocannon and rounded lascannon turrets. I'll work on them as and when. The only turret among the mentioned tanks I have is a las-plas Razorback turret, currently sitting on a current-version Rhino. Here are the renders I did the other day for the Rhino. I normally only work with one color and I used a lighting system for my Leman Russ, but didn't set anything up lighting-wise and the darker grey I originally used obscured some detail, especially on the front. Parallel surfaces doesn't help either. Last time I looked, I think I was around 2-300 verts and faces. Does this sound right for inserting into a typical game engine? That was usually around what you'd expect for an RTS from about 10 years ago. These days the average 'off the shelf' computer can handle a lot more, so today's RTS usually go up to around 800-1000 faces for a vehicle. I think you could certainly do with adding a few more segments to the circular hatches. Otherwise, the model is looking pretty accurate (I've got a lot of these old tanks). I did have the thought of just having those ones as placeholders and redoing them, same with the wheels (or half-wheels in reality). 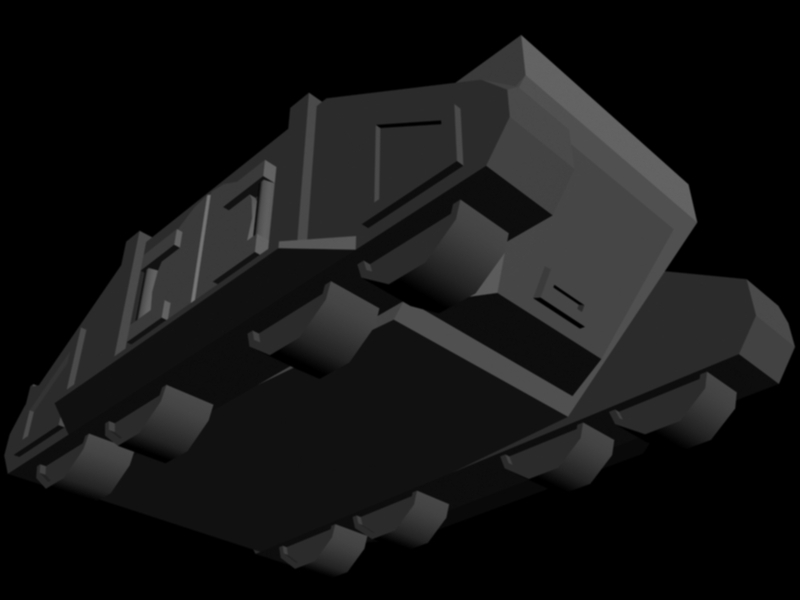 Unless I go ridiculous detail (~32 verts per rivet head and the same for each half of the side doors, and then chamfering every edge), I think I will only reach 1000 verts with all the sections of all the vehicles combined. I have three and half old Rhino chassises (correct spelling?) right now, with another coming soon and possibly getting another for xmas. I've been using the actual models and a sort of micrometer/ruler to figure out sizes and distances. I agree that they are nice vehicles, really good considering the parts for the Rhino itself only come from two individual sprues. It's sort of like video gaming in a way: There're all these impressive and advanced modern games on the market, and yet the retro stuff still has that refreshing, simple feel to it. Remember you don't need to actually model the fine details. You can really achieve a lot in a game engine with normal maps.